If needed, you can merge one or more tickets into another ticket. You might do this if you receive two support requests about the same issue from the same end-user, for example. Note: If you are on the Enterprise plan, ticket merging is not automatically enabled for agents. You must check the Can merge tickets box for your agent roles. See Creating custom agent roles. It's also possible to merge a group of tickets into a single ticket. See Bulk merging tickets. The tickets must be less than Solved. You can however merge an unsolved ticket into a Solved ticket. Doing this will not reopen the Solved ticket. The tickets can't be shared with another Zendesk Support instance via Ticket sharing. If you unshare a ticket, it can be merged. You can merge two tickets with different requesters. The requester of the ticket you close with the merge is added as a CC to the new ticket. If anyone was CC'd on an original ticket, they are also added as a CC on the merged ticket. If you don't have ticket CCs enabled, you can only merge two tickets if they are from the same requester. The most recent public comment from the ticket being closed with the merge appears in the new ticket's comment thread with a link to the closed ticket, where you can review previous comments. No other comments appear directly in the new ticket. Ticket fields, including Tags, Type, Priority, and Status, aren't carried over from the ticket being closed with the merge. Only fields that are filled out in the new ticket are saved. Merges are permanent and can't be undone. Open the ticket that you want to merge into another ticket. 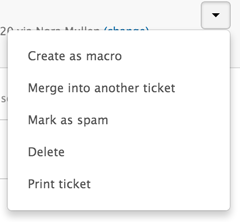 Click the Ticket options menu in the upper right, then select Merge into another ticket. You can enter a ticket number, select one of the ticket requester's open tickets, or select one of your recently viewed tickets. 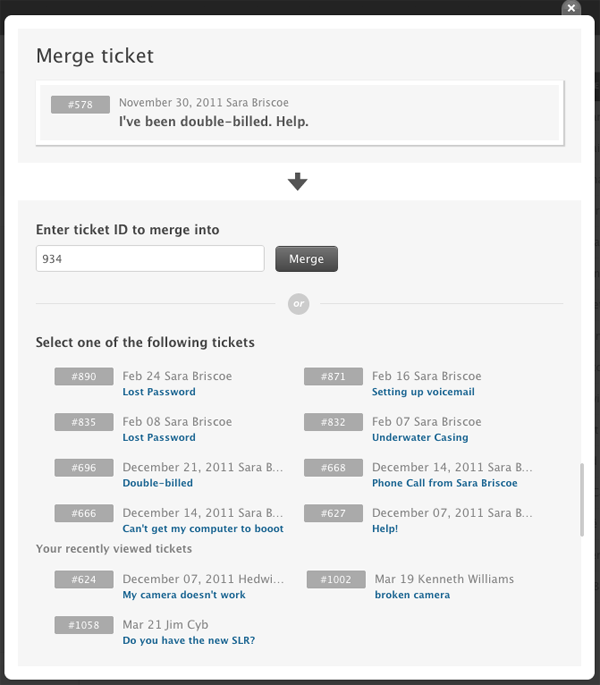 When you select a ticket to merge into, you'll be prompted to confirm the merge. You can also edit the merge comments that are added to each ticket and also set whether or not the comments will be public or private using the Requester can see this comment option. Note: There is a known issue where Markdown might inappropriately render in merged ticket comments, even if Markdown is not enabled. Be sure that you merge the correct tickets. Ticket merges are final; you cannot undo or revert a ticket merge. The ticket that was merged into another ticket is closed. when an agents belongs to multiple groups (such as FR, EN, PL...with FR as default) , how is the system deciding in which group to close the ticket into when merging ? It seems to be random for our account and does not follow the default assignment group set up on agent's profile. Nicolas, whilst an Agent can be part of several Groups, a ticket can only belong to one Group therefore when any action that occurs to that ticket the Group is known already and does not need to be calculated. Ok meaning, if a ticket 1 is created within EN group but is merged with a FR group ticket 2, ticket 1 will be closed under EN/agent's name. Can we workaround this by assigning ticket 1 to FR group 1st so it gets merged within FR group? At least things are happening as expected then which is good in general although does not help you. Unfortunately what you want to happen requires either you develop your own app to merge the tickets or your agents will have to go through multiple steps. Sorry. No worries, that clarifies the expected behavior, that is the most important thing. When I merge Ticket B into Ticket A, the content of Ticket B appears as an added comment from me in Ticket A. I'd rather that the comment appear in Ticket A from the person who originally sent Ticket B instead of myself because it causes confusion with others involved in that ticket. It's not really clear that Ticket B was actually from someone else and not me, except for the line at the top off the comment saying so. Is there a way to make the merged ticket appear as a comment from the author of that merged ticket and not the agent who did the merge? While I do agree with you that this would be a helpful feature to have given the nature of ticket merging, sadly I don't know any way to align the merging process with the original user who made the first post. I believe that the logic behind the merge is such so that the Requesters on the ticket know it was the agent who made the action, but I could logically see arguments made for your use case. If there is not already a post on our product feedback boards, I'd suggest making one there about this concern to see if there are any other users looking for this sort of feature. When tickets are merged, the ticket being merged is closed. There is no regard for Required fields. Is there any way to modify the merger or closure to only take place once all Required fields are completed? Unfortunately there isn't a way for a merge to be intercepted when required ticket fields are not filled out. There isn't a functionality built in the product to do this. The reason why tickets can be merged is to prevent to work on to identical customer requests. If the issues are identical there is no need to fill in ticket fields in two tickets. You can just fill in the ticket fields of one ticket. I'd also recommend subscribing to the article so you'll be updated with any further comments. We truly value customer feedback and your voice and votes in the forums help influence future Zendesk functionality. Does anyone know if it is possible to restrict merging if some required fields (of ticket to be merged) are not filled in? Because of that issue we have quite some tickets with empty priority field. I've checked on this for you and at present there isn't any way you can restricting the merging criteria like what you are looking for. If the tickets are still in an active state you could like at using triggers or automation's to achieve updating the priority on those tickets as needed. Hi, Is there a way after merging two tickets to make sure the SLA of the ticket I merge into stays even though a public notification of merging has happened. 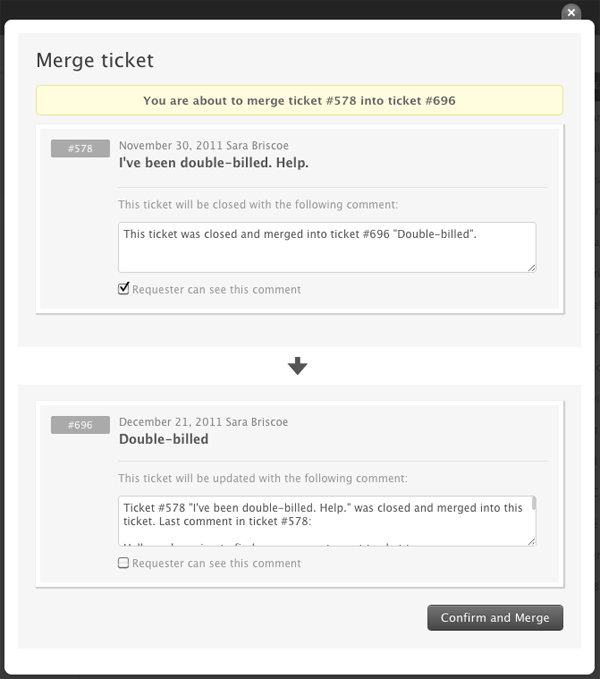 You could potentially merge the ticket and not send the merge comment as a public comment, if you wanted? An internal comment would not impact the Next Reply time SLA. You could then have the agents make a mention of the ticket merging separately in their next reply. Barring that, there really isn't a way to force the SLA timer to ignore the public comment you made when determining next reply time SLA adherence. Thanks Dennis! :) I gathered that would be the only workaround. I am merging tickets when a customer contacts us via a public wall post which we respond to publicly asking them to private message us which is what then creates the second ticket. When I report on the number of complaints received each week, the original ticket is counted and so if the merged ticket. As these two tickets relate to the same issue, I need them to count as just one on the report. How can I get around this? When you merge two tickets, the one that's closed get a closed_by_merge tag. You should be able to edit your report to exclude tickets with that tag. That should take care of the problem! I have just merge 2 existing tickets. But only the last comment from the ticket I merge from went in to the ticket I was merging to. How do I get the whole ticket to merge over? It's not possible to merge all the comments from the merged ticket into the target ticket; there's a link in the target ticket that allows you to view the comments on the merged ticket, so that information is still accessible; just not all in one place. The only way you'd be able to get the comments from the closed ticket into the active ticket would be manually - either copy/pasting, or taking/attaching screenshots. Can you give me more information about why you would need everything moved over? This would save a little bit of the jumping-around that one has to do in the GUI; if it's not an option yet, I would love to see it added, or find a way to rig up a custom hotkey setup to do it. Is there a way to merge tickets without notifying the Requester? The answer to your question depends on whether the requester is an agent or not. If the requester is NOT an agent, you should have an option to make the merge comment private when you select merge. If the requester IS an agent, you would need to disable your triggers in order to avoid notifying the requester. Let us know if you have further questions. Have a great day! Is there a way to change the default text when merging tickets? A lot of our customers get irked when they see the word "Closed" in the merge message. Since the original ticket is being closed in the system, I don't think there's a way to change it. But, I am looking into it to see if there's something that can be done and will let you know if I discover a clever solution. Hello, to understand our process, we never 'close' a ticket as they often reopen some time later. Therefore we just put all tickets 'on-hold'. Is it possible to make a ticket move back from 'on-hold' to 'open' when another ticket gets merged into it? This way the ticket will move to the assignee's open tickets? Right now when I merge something in, i then manually make it 'open' to make sure the assignee sees the new comment. Maybe setting up a trigger? Thanks! I think you should be able to do this with a trigger...the only tricky thing is that there aren't any trigger conditions that relate to ticket merges, so you'd need to use some other criteria to get the trigger to fire. Off the top of my head, the easiest way would be to use the Ticket > Is > Updated and Comment text > Contains the following string > [text string here] conditions, and use the "closed and merged into this request" string from the comment that's automatically added when tickets are merged. I tested this in my own instance and it worked like a charm! The only caveat to making triggers fire based on text strings is that it could end up firing when you don't want it to, so bear that in mind. Given that this is a really specific text string that is very unlikely to show up in another scenario, though, I don't imagine it'll be a problem. Thank you Jessie! It took me a while to be able to test it out, but I just confirmed it works! This will be a huge help. Thank you for your guidance! Glad to hear we got that sorted out for you, Katherine! Is there a way to uncheck the "requester can see this comment" by default? or simply not show the option? We never use it and it's always annoying to have to uncheck 2 boxes everytime. That part of the workflow is not customizable. If all of the comments on the ticket are internal, that box won't appear at all. Otherwise it's hard-coded that way. Sorry for the inconvenience on that one!